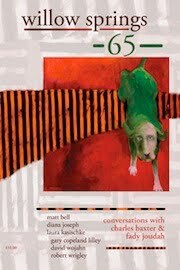 Before my first book, Eve's Red Dress, came out in 2003, I admired the cover art on the book of another poet I knew. When I attended the book party for that poet, I met Brian Rumbolo, the artist, and asked if he'd be interested in doing my cover art if my publisher agreed. He said Yes and my publisher agreed. I loved the cover that resulted. So when the manuscript for What Feeds Us, my second book, was together, I asked my publisher if we could again use the same artist. Again, he agreed. Again, I loved the result. So when the third book—okay, you get the picture. 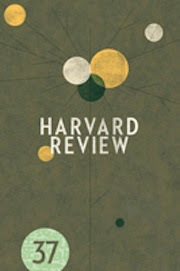 Yes, my new cover is by Brian Rumbolo. I think he's an amazing young artist. 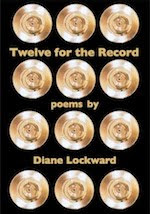 I sent him the title poem and a handful of others that I thought captured the essence of the collection. He then sent me one piece. I loved it, but since Brian had in the past sent me several sketches to choose from, I asked for one more. I was asking for trouble as I loved that one too. (No, I don't love everything! I'm really not that easy to please.) I vacillated for a few weeks. I made the mistake of asking for other people's opinions. I say "mistake" because the votes were 50-50. But my publisher favored the first one and so did I by that point. Then someone said, "Oh, that's Hiroshige's Wave." I didn't know who or what that was, though it turns out that I should have. I did a Google search and the first thing that came up was the exact image of MY wave. I thought, Oh no, now I can't use that one. But I did some more research and learned that Hiroshige himself had borrowed the wave from his teacher and that it has become a practice and a tradition for other artists to create their own renditions of the wave. I liked that sense of history. Other artists have put boats, trees, flowers inside the wave. I liked my piece even more now with its insertion of a woman—and there's a woman in the title poem, a woman who wants to walk into the sea. I also learned that this tradition is associated with Japanese haiku. Poetry and Art. Furthermore, my title poem is an ekphrastic one, based on Matisse's Open Window. So I was back in love again. 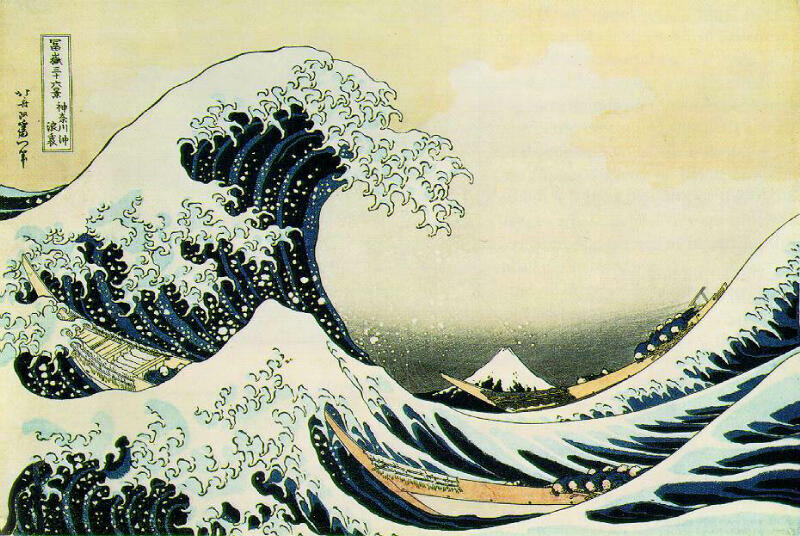 When I later asked Brian if he'd used Hiroshige's Wave, he replied, Oh yes, it's my favorite image. Mine too now. And so my mind was made up. Then onward to the layout—the publisher's job. I asked him, though, to leave as much of the art work visible as possible. Thus the name bar at the bottom instead of my name somewhere in the midst of the art work. Ta Da! Drum roll, please. I'm pulling the veil off the cover of my soon-to-be-released book. I hope you love it as much as I do. Story behind the cover will follow soon. For now just the cover. Look, but don't touch! Eight journals have been added to this update. Each addition is indicated by a double asterisk. will begin accepting in Sept. I've fallen way behind on my New Year's Writing resolution to be more productive, to show up at the desk more often. True, I've been busy with other things, but the itch to get the pen moving is coming back. I feel that in a physical way, a restlessness, a little tingly thing going on inside. So no more excuses. I'm done with all my school visits. My new book is in the publisher's hands, though I'll still need to proof the galleys. The snow is finally gone and the flowers are coming up. Time to spring into action, into poetry. I'll be leading two workshops this month. Time to practice a bit what I'll be preaching. So I'm turning to a book of prompts. I know that some poets disdain prompts. But this poet loves them and says so in public! Bring them on! 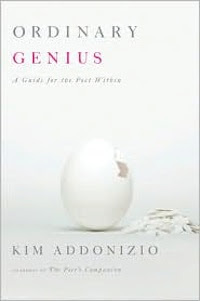 I'm turning to Kim Addonizio's book, Ordinary Genius: Guide to the Poet Within. 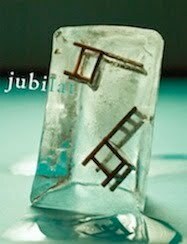 I've already read it and even gotten some poems from it. I need to dip back in and try some of the other prompts that I marked. If you don't already have this terrific collection of prompts and craft tips, rectify that omission right now. Get thee to Amazon. Order thee a book. Here's an interview Rachel Dacus did with Kim at Fringe Magazine. 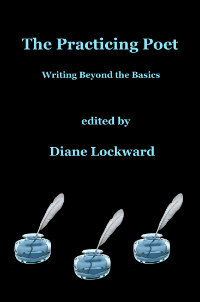 Kim talks about some of the differences between writing prose and writing poetry, learning the craft of poetry, and some elements of craft. Rachel is currently taking a course with Kim in Kim's house in California. That fills me with envy! I want to be there, too. At least I have the book which I've already pulled off the shelf and will use to get me back in action. I spent every day this week with third graders. Need I say that I'm really really tired? Third graders are adorable, so open to trying new things, so full of imagination. They write amazing poems. But oh my, the energy level. Forget about sitting down. I was on my feet the whole time for each of four one-hour sessions all five days. Three cheers for third grade teachers! Fortunately, this school is one town over so my drive was fast and easy. And I now know my way around the school as this was the fourth year in a row that I've been their poet-in-residence. We did a new poem each day. Day 1 was a color poem, day 2 a rose poem, day 3 an ekphrastic poem, and day 4 a memory poem. My favorite this year was the ekphrastic poem, my first time trying that with such a young group. Back in January when I met with the teachers for a planning session, they told me that parents had been coming in all year teaching the kids about famous paintings, so they wanted something that would bring art and poetry together. The timing of the ekphrastic poem could not have been better. The title poem of my forthcoming book, Temptation by Water, is an ekphrastic poem, based on Matisse's The Open Window. So I showed the kids a print of the painting, and we talked about the colors and the details. We talked about how it provokes curiosity. I asked them how they might get into the picture and what they would do once inside. Then I read them my poem, a bit over their heads but it's short and they heard the colors and details and understood how the woman in the poem got into the painting. Then I told the kids that I'd sent that poem and a few others to my cover artist and how he'd used the poem to stimulate a piece for my book cover—again, art influencing art. 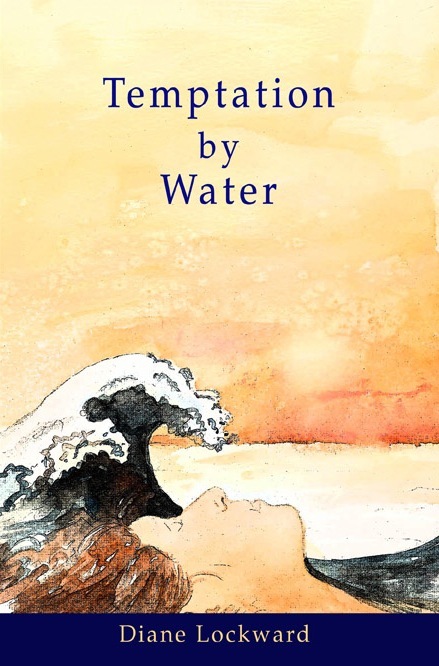 My cover is a rendition of Hiroshige's Wave, so yet another example of art influencing art. I'd found a portfolio of prints Hiroshige's One Hundred Views of Edo and used five of them for the writing. I put them on the board, and we pretended we were in a museum as the kids lined up and walked by and studied each print. Then back to their seats to get the writing underway. Fabulous poems! Full of colors and details, imagination, mystery, and wonder. 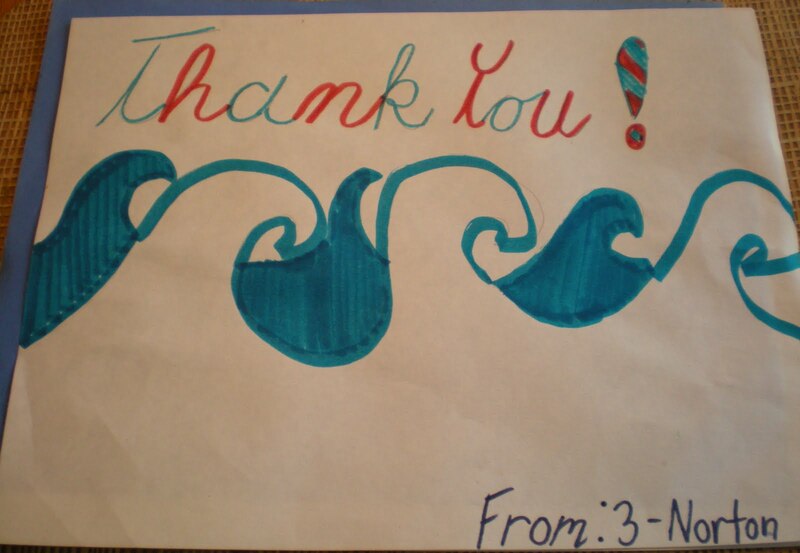 This sweet card was presented to me yesterday, signed by each student. And on the other side . . .
Two weeks ago I spent time at Chatham High School as the visiting poet for Mrs. Lori Roper's English classes. On both Monday and Friday I spent one hour with a group of seniors and then one hour with a group of freshmen. We talked a bit about poetry. Then I took the kids through two different writing activities. They were such terrific groups! They read their poems, and I was very impressed. 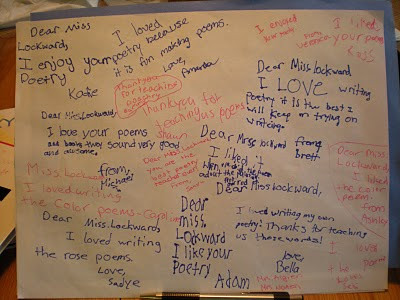 But no surprise, really, as that's what happens when a teacher brings poets and poetry into her classes. There is simply no better way to get kids thinking creatively and playing with language. So kudos to Lori Roper for initiating the Guest Writers Series at her school. 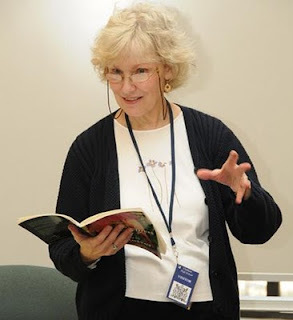 When Mrs. Roper began teaching at Chatham High School, she inherited the school's dormant literary magazine. She held an Open Mic night and brought the journal back to life. Then she went a few steps beyond and applied for and won an Unsung Heroes Grant. With the money which is given for her discretionary use, she began the Guest Writers Series and a Poetry Festival. Not one festival per year, but two! One in the fall and one in the spring. It was my pleasure to be part of last Friday's spring Poetry Festival. The event was held in the auditorium which was packed with approximately 500 students. Students came in for a single period as they were able to be excused from classes and/or during free periods. Each one-hour session included students who had signed up to read poetry or sing. The poetry could be something the student had written or simply something the student liked by someone else. The music was a wonderful addition to the festival. There were individual singers, duets, and groups. Lots of instruments. And in the background was a large screen where student art was projected. What a wonderful mixture of poetry, music, and art. My role was to read 3 of my own poems. It was quite thrilling to read for such a large audience—as well as a bit terrifying, especially in a dark room where I could not see any faces. I loved being Chatham's Guest Writer and then reading at the festival. I hope the administration and students realize how fortunate they are to have Lori Roper on the faculty. The Chatham Courier ran an article about my visit.